Fancy a holiday in the middle of the forest? Then this holiday house is exactly what you're looking for. With a 3-hectare garden, you can really feel the freedom of the outdoors here. 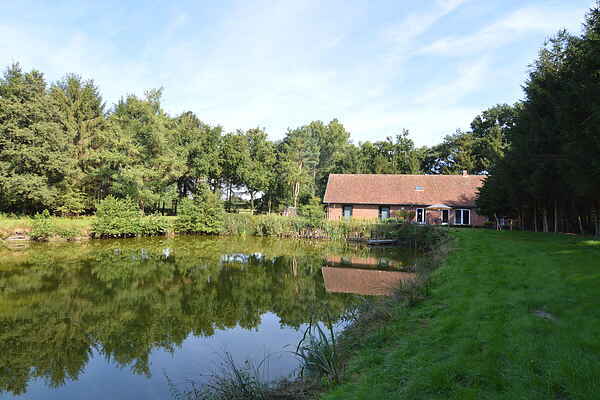 There is a large pond behind the house where you can fish or even go for a refreshing dip in warm weather. Kids will also find lots to keep them entertained in and around this holiday house. They will be surrounded by nature during their stay here. Explore the large garden and build a hut among the trees. They can play to their hearts' content in complete freedom here. The Speukels Speuren bike route in Turnhout is another nice activity for them. Turnhout is not far from the house. And adults will enjoy the Kasterlee cafe quest. This bicycle tour will take you along quiet country roads, past poems by Geert De Kockere and to charming outdoor cafes. Besides all this, Turnhout is also a town of cards, beer and other regional products, so be sure to keep this in mind and follow the Biertroefroute, a tour that combines beer and playing cards. Antwerp is an hour's drive away, and is a must-see destination for shopping. The holiday home is situated close to the Dutch border, so the towns of Tilburg and Breda are also within easy reach.